Some of my work on orbital images made by the THEMIS camera on Mars Odyssey can be seen here. The color of this text attempts to mimic the color of Mars as it appears through a telescope. The background is a similar attempt to suggest what color a strained sample of powdered soil from Mars might appear when smoothly compacted. The reason for the discrepancy in brightness is the context in which the color is seen. Sunlit against a black background, a sample of the darker color can indeed appear to the eye like that of this text. Once on the surface of Mars the color of the scenery fills the visual field and becomes the reference for the eye instead of the black of space as when the planet is seen through a telescope or from a distance. 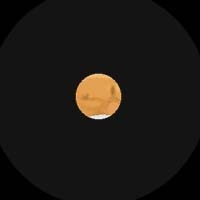 The fact that the Martian sky is bright near the horizon causes the scenery to generally appear silhouetted against it. 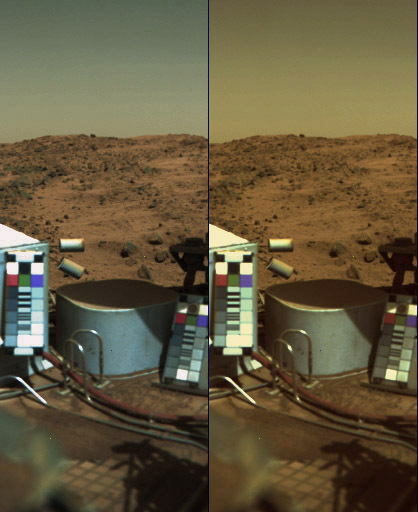 The processing of the first color image made from the surface of Mars by Viking one has undergone periodic changes. 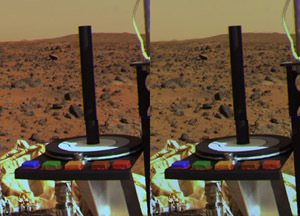 Right: Scan from an original print of the initially released version of the first color picture from the surface of Mars. The intent was to show a gray sky, but the initial batch of prints were color balanced too blue. Left: The first Viking color image was supposed to show a non committal gray sky since they were still getting used to the idea of a non blue sky indicated by comparison with the color chart and other surroundings. A slight mismatching incorporated into the mass print run overnight caused them to turn out too blue. (top left) An amber-brick colored better version was soon distributed in its place (second from top), naturally after all the magazines ran the first color release. This second version became the basis for many subsequent reproductions of this image, which in time drifted wildly in hue and saturation. A more careful balancing of the colors was later made to provide neutral white lighting values to the scene. This reproduces a view as if lit by a noontime tropical sun. (second from bottom) The sky is the color of the perpetually suspended dust. The pink-amber sky glow provides extra ambient lighting to the scenery, making the color drift in that direction from the mean average color. (bottom) The dark rocks are a quite dark nearly neutral gray. Right: The first color picture adjusted as it would appear 'on site'. If anything the soil is a bit too light, but the limitations of any pictorial medium compared to reality must be taken into account. I think we will be surprised by the electronic images captured by as yet undesigned hand held cameras. Such a picture taken at the Viking One site, assuming it is the same as we last saw it by then, may look something like this. Some issues concerning reproducing natural color are subtle, an interesting example being the case of the Martian surface. The 'actual color' of a sample of Martian dust in a laboratory would appear like a lighter grade of powdered coffee, a dark powder reflecting around 15 percent of the light striking it. A photograph in natural color taken on the surface will be influenced by sunlight filtered by dust and overall differences in the sky color if trying to match an initial visual impression. 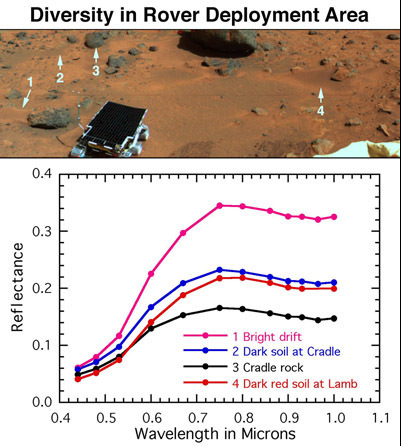 Left: Here is an example of the duality of 'true color' on Mars. The right color chart in the view is used as reference. The scene lit as if by a noon time Earthly Sun is at the left, the scene factoring in the contribution of the ambient lighting effects of the amber sky is at the right. Ones initial visual impression when stepping onto the surface would probably trend toward the latter, but the ability of the human eye to compensate for color imbalance would soon make the view trend toward the former. The sky, tuned toward the blue when 'neutralising' the color balance of sunlit surfaces, should appear closer to that on the right. Color balancing a sunlit scene which includes a bright 'self luminous' component like the sky is sometimes not as straightforward as one would like, particularly with the Viking camera whose red color filter drifted well into the infra red, and whose other filters overlapped either not at all or very differently from the sensitivities of human color vision. Rght: A similar image strip. Infra-red images obtained along with the visible RGB exposures allow better reconstruction of the color, including the blue portion of the color chart which generally appears purple in Viking color images, the more so when ambient sky lighting is factored in. 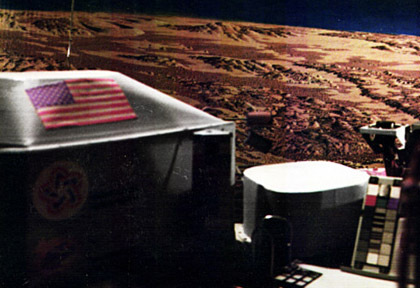 At left is a photo I made of the Viking Science Test Lander while it was at JPL in 1975, carefully color balanced from the slide scan for the spacecraft color chart. On the right is the same portion of the real lander on Mars. At right is a scan from a color print of a photograph taken by the Viking camera of the surrounding Science Test Lander and part of my painted backdrop under incadescent lighting. Allowing for a modest shifting color balance across the image, The color balance of the art and sky isn't too bad, and the gray of the lander paint contrasts well with the colors of the flag. 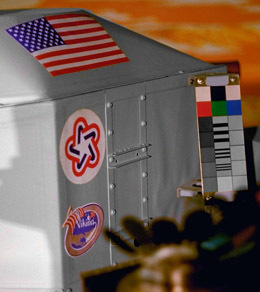 Notice the purple cast of the blue pigments in the flag and the color chart, an apparent idiosyncrasy of that camera system. One great site which has made a dedicated effort to show what the Viking 1 and 2 landers saw can be found here with groups of images from each lander reachable from the upper navigation bar. The general coloring of the Martian surface is a dark yellowish brown ocher, with a sky loaded with dust which appears a yellow ocher tan near the horizon and darkens dramatically toward the zenith. The dark basalt rocks strewn everywhere are a very dark neutral gray when dust free. 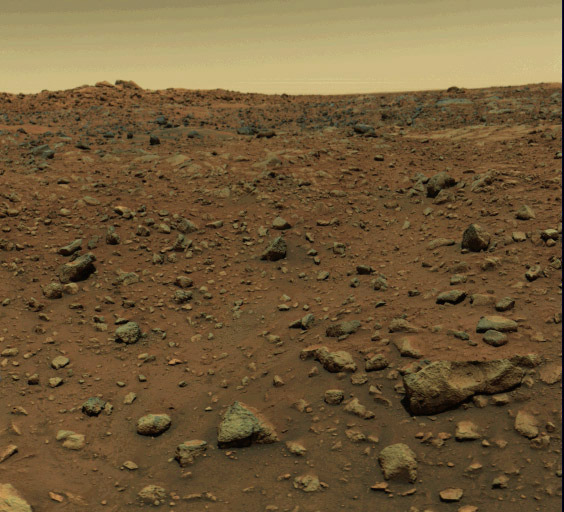 The next look at the Martian surface was provided by the Pathfinder lander, which carried a high color fidelity camera. The IMP camera had a narrow field of view and suffered from varying optical quality of the filters, but the color mosaics returned by the camera were excellent. Many dedicated people have worked hard to present the wealth of new information about our neighbor world and my comments only attempt to tentatively build on their work, not to deride it. The color of the scenery was evaluated and presented in a series of images displaying the spectral types of the soils and rocks. Early in the Pathfinder mission a panorama was obtained before the camera mast was released in case the shock disabled the camera. The color target was nearby then against the martian surface. This view, excerpted from the panorama compiled by Mark T. Lemmon, shows the target and surroundings adjusted as I think it would appear in neutral white lighting (left) and in Martian ambient lighting conditions (right). I examined an identical copy of the color target at JPL during the mission. Pathfinder obtained excellent color photos, here is my submission of more or less an 'astronaut's eye' view of what the cameras revealed. Below is a composite image released by the Pathfinder team, recolored to more closely approximate the probable actual colors. I have attempted below to to extrapolate and 'fine tune' the colors from the Pathfinder results.